Did you know the ASA logo was designed with great care and lots of prayer during the formative days of ASA? From the colors to the shape of the the letters, everything has a meaning. 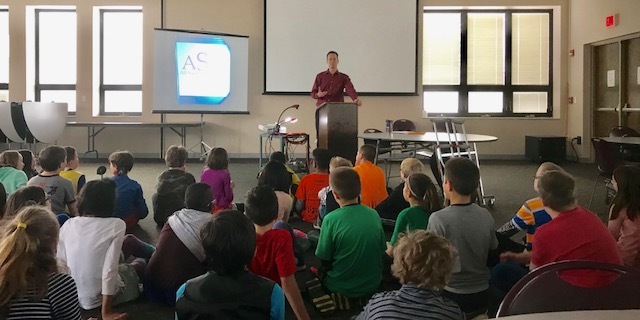 During Catholic Schools Week 2018, David Wodarek, father of 5th grader Cadan and recent graduate Rhiannon, spoke with ASA students about the work that he and the design committee did during the creation of All Saints Academy to select colors, a logo and even a mascot. 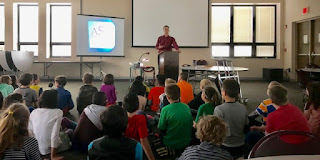 Mr. Wodarek shared the inspiration he received in prayer and the rich mysteries of our faith revealed within our 3 little letters and ASA’s school colors! Inspired by religious iconography and the importance of meaning contained within color choice, ASA’s gold, red and black was intentionally selected. The gold of the cross represents intellect and learning. Red is the color of blood and zeal. It was selected to visually connect us to our Eucharistic Community, confirmed in our more recent defining of our root belief that We Are One. Black ties the logo together and symbolizes the works of the Holy Spirit, and the sacrifice and work our community did to create ASA and continues to do together to Form Saints to Serve All! These colors also speak to us about the mystery and love of The Trinity as well as our call to discipleship. The Cross points us to God the Father who sent us his Son. The red of the letters remind us of the love of Jesus, God the Son. The black of the All Saints Academy connects us to the workings of the Holy Spirit in our lives. The point where the cross connects to the “S” reminds us that as disciples of Christ we, too must pick up our cross and follow him. The shape of the logo also reminds us of the mysteries and many graces of our faith. The cross and letters of the logo are designed to look like the top if a Baptismal Fountain, connecting us back to our baptismal promises and foundational Catholic beliefs. As Mr. Wodarek reminded us, our baptism was the beginning of our journey to become Saints and serve all. As we celebrate 10 years of All Saints Academy we look back on all the learning, the sweat (and blood), and sacrifice that has gone into building this great Catholic school community. This year we added a 10 to the logo to commemorate the growth and trials, as well as the successes and community built in this first decade of All Saints Academy. At the center of the 10 the cross keeps our focus on Christ as we eagerly look forward to the next great 10 years of ASA! All Saints Academy’s seventh grade and the St. Alphonsus Senior group got together for a day of fun, food, and fellowship the week before Christmas break. “One of the reasons this day was developed was to begin to reach out to our parishes without students on site to bridge that visual gap. 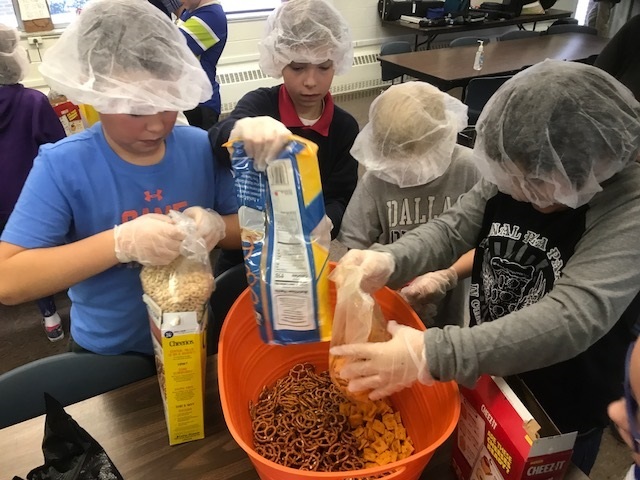 Knowing St. Al’s has a very active senior group, I thought that was a good place to start,” explained Mrs. Zimelis, seventh grade homeroom teacher. After contacting Virginia Scholten, St. Al’s Senior Group Coordinator, the planning began. A ventriloquist was the next activity introduced, and there were many puppets to go around! Students jumped right into this creative activity as the seniors encouraged them with role plays and scenarios. A short while later, when some joined in the kitchen to make pizzas and decorate cupcakes for lunch, others played card games and learned a little bit more about one another. After lunch and games, karaoke was most definitely a hit! In fact, the students would have kept going had we not stopped and moved on to whittling trees (practicing on bars of soap) and tying knot scarves. When Chris and Summer Malinzak moved back to their hometown of Grand Rapids this past July, the question arose of where their children would attend school in the fall. 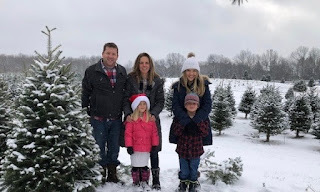 It was a little easier decision for their older children, Tobee and Zoe, but the more difficult choice came for their younger two kids, Max (1st Grade) and Poppy (Kindergarten). Nine years ago the Malinzaks moved from Grand Rapids to Ohio. They found a home for their children at St. Rose of Lima and fell in love with the Catholic school from the beginning. Summer was very involved, volunteering wherever she could. “Whenever there was a new family, I was the one they called to be an ambassador for them,” she explained as she discussed how well she knew the ins and outs of the school. After discussing their options, they chose to visit All Saints Academy. Chris, a St. Jude alum, was familiar with the ASA Middle School but not as familiar with the Elementary Campus located at Blessed Sacrament Parish. Fast forward to January and the Malinzaks feel like they’ve always been members of the All Saints Academy family. They have joined Chris’s home parish of St. Jude. Summer volunteers every Wednesday on the playground and in the lunchroom. She and the other kindergarten moms get together about once a month to socialize and talk about what moms mostly talk about...their kids. Max and Poppy have made new friends and seem to always have big smiles on their faces.